Topic started 9 months ago by BigGiRL in Experience and Innocence tour. Since then 8 posts have been made by 6 users. Comes a time when there is a bit of explaining to do. But who is doing the talking? And can we believe a word of what we are being told? All of this, and a lot more besides, is at stake in U2’s eXPERIENCE & iNNOCENCE tour, which hit the road in the US a few short weeks ago. An extraordinary technological adventure, it tells the story of a rock ‘n’ roll band, from their early battles in Dublin to striding the biggest stages in the world. Shot through with a chilling dystopian thread, it poses what may be the ultimate question: is there any hope for us at all? Bono, The Edge, Adam Clayton, Willie Williams and Ric Lipson set the scene. And Macphisto adds his two cents worth. Reading between the lines, would you welcome, please: Mr. Pat Carty. Tulsa, Oklahoma. Situated on the Arkansas River, between the Osage Hills and the foothills of the Ozark Mountains, it was built by the Lochapoka Band of the Native American tribe known as Creeks. But it is best known for a song written by the peerless songwriting duo of Hal David and Burt Bacharach, which was a big hit in the UK for Gene Pitney. The narrator in the song had been on a long road trip across the American hinterland. Tired from driving all day, he decided he was too bushwhacked to continue and needed some kip. In all innocence, it seems, he stopped off for the night in an unspecified, distant town and then… well, something happened. To him. Something totally unpredictable and disruptive. A life-changing experience. And then comes the killer revelation. It’s like a certain Macphisto phoning in and talking to someone else’s wife. Except it isn’t. To locals, Tulsa is an oil town first and foremost. But to the rest of the world it is a synonym for Marital Infidelity. “Sounds like my kinda place,” Sam Snort had said to me in a pre-trip debriefing. And who was I to argue? He’s a pal of Macphisto’s, after all. By the time the great and good of the Irish media arrived in Tulsa, we had little choice but to repair to the bar, in a vain attempt to stave off the onset of jetlag. So we did. And what a bar it was. If you have a hankering to see the minutiae of the Big Dog Daddy’s career on display, then ‘Toby Keith’s I Love This Bar & Grill’ really is the place to be. On the run-up to the opening night of the eXPERIENCE & iNNOCENCE tour, hints about what we might expect from the new show had been thin on the ground. I had downloaded the U2eXPERIENCE app, and pointed my phone, as instructed, at the Songs Of Experience album cover to see a brief snippet of an augmented reality Bono croon the opening bars of ‘Love Is All We Have Left’. That, however, told me precisely nothing about the show. Back at the bar, bleary eyed, I asked RTÉ’s motor-mouth wax-juggler, and long-time U2 associate, Dave Fanning, what he knew. He speculated that elements of the iNNOCENCE tour would be retained, but otherwise he was as clueless as me. Over breakfast the next morning, I put the same question to Telegraph journalist and former Hot Press-er Neil McCormick, a friend of the band since their school days. He was at a loss too, although we did have fun speculating on future U2 tours. After all, Roy Orbison’s hologram has been selling tickets, and that same week ABBA had announced that they were planning to send out avatars of their younger selves. All we needed now was to hear that Gene Pitney’s hologram was rejoining The Rolling Stones as support act for the remainder of their world tour. By the time it’s U2’s turn, perhaps it will be Bono’s cryogenically preserved body that will do the honours. “Nothing wrong with that concept,” Sam said to me down the line later. I scratched my head and said nothing. I felt like I was still twenty-four hours from Tulsa. It was time to take a nap. 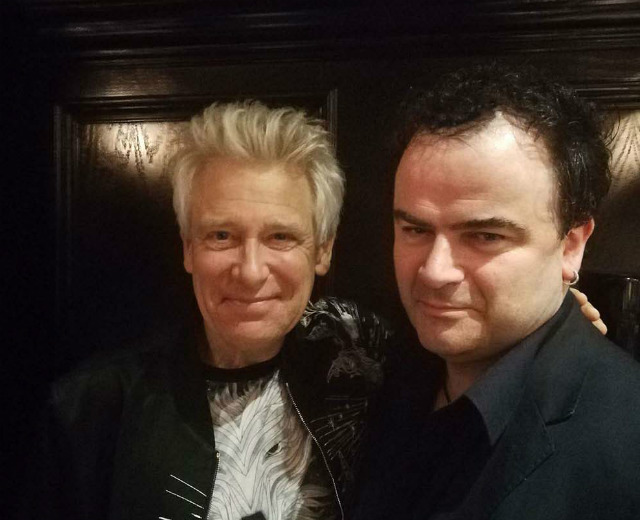 It’s disconcerting, to say the least, for a neophyte, to have The Edge and Adam Clayton walk into the dining room where you’ve just pushed back your dinner plate, but there’s no time for idle gawping. These men are under pressure, one day away from show time. And there’s more work to do. Lots of it. Is there ever a worry that the technology will get in way of the songs, drowning the sound with light? “The tech is one half of what you’ve got to do”, Adam reflects. “Thirty-five years ago, when we played in Cain’s Ballroom on the other side of town, we were probably the first European band to come through that month, so people were interested. Nowadays, there’s a band through every weekend and they’ve all got bells and whistles, so we like to play with that technology and try and do something different. With other acts and venues trying to quash the use of phones at gigs, why are U2 embracing it with the augmented reality U2eXPERIENCE smartphone app.? Speaking of Cain’s Ballroom, why start in Tulsa? “Well, we definitely didn’t want to open in New York or LA”, The Edge answers. “We wanted somewhere with a little less pressure, and we hadn’t played Tulsa in living memory. It also dawned on us that this is quite a conservative part of America, so it’s exciting for the show to be seen for the first time in a place that’s not a typical rock n’ roll centre.” That’s putting it mildly. There’s another factor to consider here: in the 2016 presidential election, Trump took a whopping 65% of the Oklahoman vote. The Republicans have triumphed in every presidential run here since 1968. Were the band aware of this going in? So there’s content in the show that might upset some people? “I hope so,” laughs Adam. There’s a pause and Adam steps in. These guys are good at interview ping pong. With the bells and whistles, playing such a large part in the show, it must be impossible to decide on a whim to do ‘Party Girl’. Is the set list set in stone? 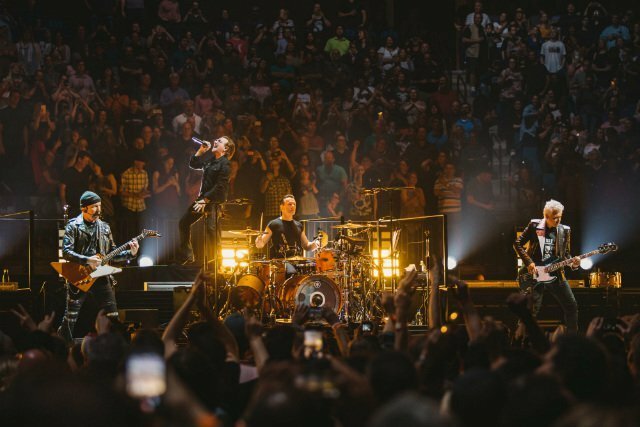 In a way, U2’s most recent tours form an arc of sorts – iNNOCENCE was a young bad starting out; Joshua Tree was the band conquering the world; and eXPERIENCE has several references to a longing for home. “The Joshua Tree part of that was not deliberate,” The Edge smiles. “It was more a happenstance kind of thing, but definitely, with iNNOCENCE and eXPERIENCE, there was an arc we were aware of. The iNNOCENCE tour was easier because it was rooted in our earlier history and the beginnings of what the band was about. This time, we’re into a more nuanced thing. What have you got to offer? What have you got to say for yourself, based on everything that you’ve been through? The end of this arc might seem like a logical place to either stop completely, or at least take a break. “I think we are going to take a little bit of a break. Definitely a long weekend,” Edge laughs as the car is pulled around to pick the boys up. There is another rehearsal to be done. With the greatest respect, there’s not an awful lot for a visitor to do in Tulsa. 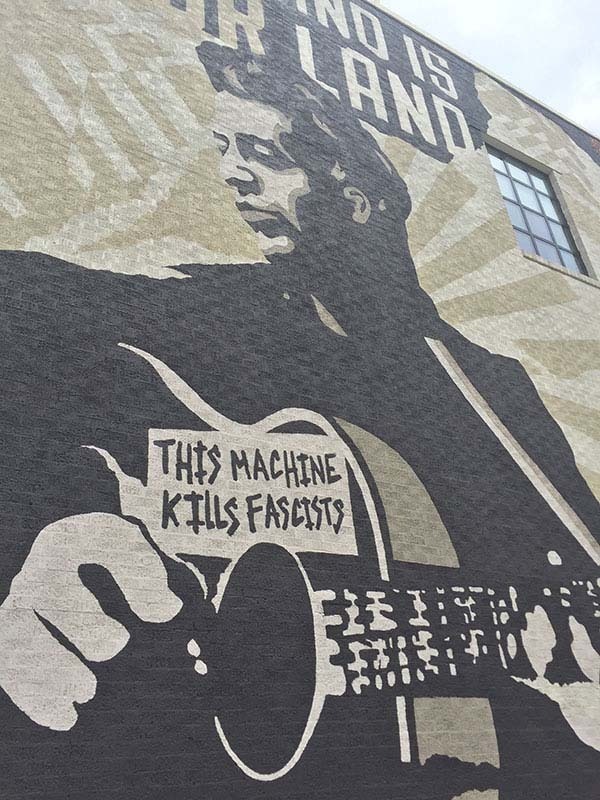 Hot Press briefly visited the Woody Guthrie Center but my trip coincided with a school tour of some fifty-odd noisily uninterested students. Before I beat a hasty retreat, I got to see Billy Bragg’s guitar – and, bizarrely, would end up telling the Bard of Barking himself all about this in a Kilmainham pub only a few days later. But that – like the phone call which denied me entry to the Bob Dylan archive on the same day, or the gathering of U2 fans at Tulsa’s Center Of The Universe who recognised Hot Press and fired questions as if there were no tomorrow – is another story. And so the BOK Center. It’s a multi-purpose arena, built less than ten years ago at a cost of about $200 million. It towers over its surroundings. The circular structure, with a capacity of just under 20,000, is impressive inside and out. U2’s stage almost divides it in half. If you attended the iNNOCENCE tour, you’ll recognise the set-up: the main stage at one end, the huge screen, hanging from the ceiling, stretching across the arena’s floor to reach the secondary ‘b’ stage at the other. It looks extraordinary, and it’s not even turned on yet. Set designer Willie Williams has worked with U2 since the early ‘80s. Zoo-TV, 360°: they all started with his magic pencils. He is aided and abetted by Ric Lipson and the good people at Stufish Entertainment Architects. Ric has worked on everything from last year’s Joshua Tree tour to the Jesus Christ Superstar arena run round. Williams was also involved in the integration of the U2eXPERIENCE app into the show. Is the scale of the show going to fit in the 3Arena? Lipson goes deeper into the mechanics of the whole thing giving Hot Press a guided tour of the stage itself. We start on the ‘b’ platform, which has been upgraded from the previous jaunt. From this small stage, we step onto the gangway within the screen itself, which sways as soon as you mount it. Stood inside the screen, noticing the marks on the floor telling Bono to stand here and Adam to stand over there, you can begin to see how it will all work. It is practically transparent for a start. The weight must be incredible. How does it all stay up? Is there more than one of these marvels to make the logistics easier? Walking onto the main stage from the screen catwalk is an odd sensation: it all seems smaller than expected. There’s Larry’s drum-kit and there’s Edge’s surprisingly modest pedal board, with long-time guitar handler Dallas Schoo working away close by. But it’s all surprisingly bare. “We actually got rid of the back line, when we did The Joshua Tree,” Lipson explains. “It was such a beautiful set that the band decided they didn’t want all those amps on stage anymore. Rock ‘n’ Roll has always been about seeing how many blinking lights and speakers you could have, but now they’ve decided ‘we’re doing art’. This band has always transcended the norm and made a new norm. Even though it physically resembles the old show, it’s been completely reimagined. The band are still finessing things as show time approaches. We’re allowed to watch them sound check a few songs from a respectable distance on the venue floor. If the fifteen-year-old me were here, he would have exploded by now. The Edge makes constant suggestions and adjustments as the band blast through a very loud ‘All Because Of You’ and ‘I Will Follow’. Hot Press is leaning against a barricade, trying to write all this down, when a voice asks how it’s sounding. It’s Bono, having moved down the gangway. Without thinking, HP jokingly replies that, “Yeah, it’s all right.” Bono chuckles and moves onto the ‘b’ stage. When the singer reaches the smaller stage, the band launch into a coruscating run at ‘Until The End Of The World’, allowing Bono to rehearse the ‘spitting water’ bit that was such a memorable part of the iNNOCENCE show. The Edge stands on the catwalk within the screen while Bono gets to his cue in front of a camera on the small stage, spitting out several mouthfuls of water. On the screen he towers over the Edge as he solos. It is a fascinating glimpse behind the curtain. Our time is up. We’re being led out as the band continue to chip away at problems that possibly only they might ever notice. But before we exit, a now familiar voice behind us enquires as to where we are going. We had been warned before hand that there wouldn’t be any time with Bono, but he shakes hands and thanks us all for making the long journey, working the room like only he, and a very few others, can. “It’s sort of like doing a Marvel movie except you’re taking it to a different city every few days,” he says. “Worse than that, for me, it’s a Marvel film where you’ve got to method act; you have to get right inside the songs in order to sing them. The show is a technical monster, but it has to have a big bloody heart inside of it. It’s a very unusual way to earn a living. He’s on a bit of a roll now. The band start up again. With that, the singer returns to the stage. We head for the door. I finished my review of the show at four in the morning in order to take advantage of the time difference. I pressed send and within half an hour it was online on hotpress.com. It does manage to cover a lot of ground, despite being composed through zombie eyes. Although running to nearly 2,000 words, however, it was not the whole story. Both The Edge and Willie Williams had played down the importance of the U2eXPERIENCE app within the show, and they were right to do so. It’s an interesting idea, but it doesn’t add an awful lot to the proceedings. When you take your seat before the show and point your phone at the stage, a waterfall graphic appears. When the show opens with ‘Love Is All We Have Left’, the AR Bono that materialised with the album cover reappears, lullabying from your device, but the real thing is there on the stage. “Well, it could have worked”, as the man himself once said. As Ric Lipson promised, the screen, and the catwalk within the screen, are more integrated into the show than before. For ‘The Blackout’ the band are backlit as ominous wraith-like shadows; the catwalk becomes an incline and Bono struggles against it as he reaches for the ‘Lights Of Home’. The video floor of the second stage updates the “preacher stealing hearts at a travelling show” of ‘Desire’ to a game show host. The screen is essential to the ‘Cedarwood Road’ section, telling the story of the band’s youth from Bono’s bedroom to the Dublin bombings of 1974. This may have caused some confusion to a Tulsa audience understandably less than familiar with Irish history, but it’s essential to the yarn being told. Williams, Lipson, The Edge, and even Bono, were all keen in advance to stress that this was not some piece of musical theatre, but perhaps they protested too much. A story, the band’s story, is being told – from the earliest days going out into the world, conquering that world, and then returning home. If and when they do finally decide to hang up their rock ‘n’ roll shoes, there is a show within this show that could carry on in their names. Neither holograms nor cryogenically preserved bodies would be required. During the brief encounter pre-show with Bono, one telling detail nudged into view. A copy of C.S. Lewis’s The Screwtape Letters had been tossed on the floor. This wasn’t some oversized prop either, just the ordinary paperback edition that someone had been flicking through. It is key, perhaps, to understanding the show’s most challenging and impressive section. Bono has mined this source in the past – his cartoon image can be seen reading it before being run over by Elvis in the video for 1995’s ‘Hold Me, Thrill Me, Kiss Me, Kill Me’. The book, a series of letters, epistles even, in which the demon Screwtape advises his nephew Wormwood in the ways of securing the damnation of souls, was also one of the main sources of inspiration behind Bono’s Macphisto character, the gold suited, be-horned trickster who made those legendary phone calls from the Zoo-TV stage all those years ago. The first hint at Macphisto’s return comes in the anime video that plays over Gavin Friday’s version of the same ‘Hold Me, Thrill Me’ during the closest thing this show has to an intermission. The clip depicts the young band being shown the way from innocence to experience by a shadowy figure, who presents the business card of “Wormwood & Macphisto Inc. Bespoke Atonement Services” before giving them a lift from Cedarwood Road to Las Vegas. There’s a quote attributed to Edward de Bono (no relation, as far as I know! ), “Mock the devil, and he will flee from thee.” It is adapted from the New Testament Epistle Of James, “Resist the devil and he will flee from you.” The Edge had said that they weren’t going to mention Trump by name, and they don’t, but there can be little doubt at whom Macphisto’s reappearance is aimed. Screwtape, at one point in the book, describes his symbol for hell to Wormwood as “something like the bureaucracy of a police state or the offices of a thoroughly nasty business concern.” Check. Just like Satan’s presence as Professor Woland, in Mikhail Bulgakov’s portrait of life in Stalin’s Russia, The Master And Margarita (the inspiration behind Jagger’s time-hopping demon in ‘Sympathy For The Devil’), MacPhisto has returned at a time when he can be most effective. “Lust, deceit, vanity, all the essentials for a showman, and a licence to just look in the mirror,” Bono proclaims by way of introduction. “Haven’t seen this guy in quite a while.” There may, of course, be a passing reference here to Judas, the betrayer of ‘Until The End Of The World’. Earlier in the evening a man with a megaphone stood outside the venue, decrying Bono and U2 for having “betrayed our Lord Jesus Christ.” The pieces fit beautifully. We’re in the Bible Belt, Jesus is big business here. There are probably places where it’s more acceptable to turn up in horns, but what the hell? A band’s gotta do what a band’s gotta do.. This song, never before performed live, reminds us we can “feel the enemy.” But “the enemy” is how Screwtape refers to Jesus, so the message is scrambled. Confusion reigns. As ever, U2 are at the heart of the contradiction. “Nothing makes sense, don’t let the bastards grind you down,” is the defiant howl, before The Edge drives the message home with a screaming solo that comes from somewhere very dark indeed. The show’s real message, the beating heart at the centre of this technological monster, is finally one of hope in the darkness; and of faith, however forlorn it might seem at times, that love will triumph over hate. How can it not, for ‘Love Is Bigger Than Anything In Its Way’? Or maybe it’s all just rock ‘n’ roll. Either way, Tulsa likes it. And perhaps, only twenty-four hours away, the ghost of a character long forgotten by most is deciding that he can, after all, finally, go home again. The full article on u2start for reading convenience and discussion. Originally posted by BigGiRL :The full article on u2start for reading convenience and discussion. U2 rationalizing a fortuitous event. JT17 is only there because they had to tour that year. "In a way, U2’s most recent tours form an arc of sorts – iNNOCENCE was a young bad starting out; Joshua Tree was the band conquering the world; and eXPERIENCE has several references to a longing for home." It's hard not to think that this was all planned as their last major tours (farewell?) before they drastically start to slow things down, especially with Bonos health problems, Larry's back and Adams recent interview.They've covered their whole lives in the past 4 years. I only think we'll see random gigs/appearances and a long break after this. Agreed 100%...and yet I still love how it worked out this way. It makes sense and is cool to view it like this even as I acknowledge that the JT2017 never was originally part of the plan.